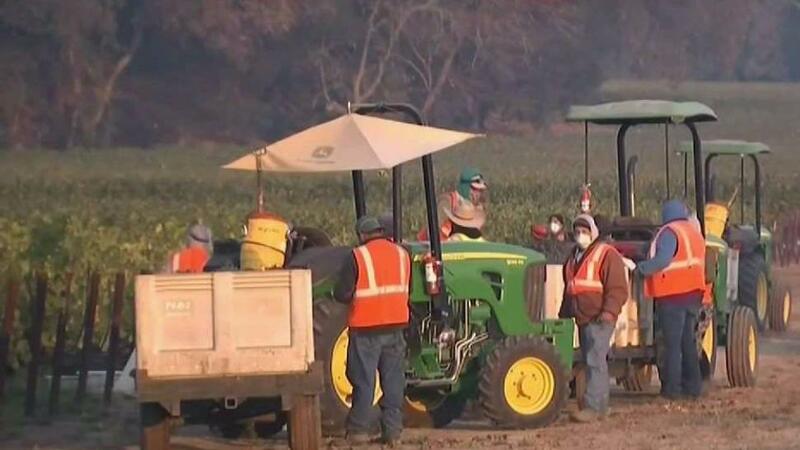 The state’s worker safety agency issued a worker safety advisory late Friday after NBC Bay Area took video of workers harvesting grapes at The Robert Mondavi vineyard in the fire-torn Napa Valley, some without any protection from the smoky air that surrounds them. While most workers are wearing some sort of mask, others use a bandana or no mask at all. “That should not happen,” said Garrett Brown, a retired 20-year veteran inspector with the state’s worker safety agency, Cal/OSHA. Brown says under state regulations, employers are required to outfit each worker with a specially fitted respirator mask, capable of filtering out fine particulates in the air. They should also limit harvesting time. According to a chart on the website of the Bay Area Air Quality Management District, air quality in Napa County ranged from unhealthy to extremely unhealthy as of Friday morning, based on high levels of the tiny particles from the massive firestorm. Bad air has prompted schools as far away as San Jose to limit outdoor activities. Brown says workers in the vineyards should be protected, and it’s up to the employers to make sure that happens. Late Friday, Cal/OSHA issued an advisory notice to employers, telling them to provide approved masks, allow for breaks and to be alert to workers becoming dizzy due to exposure. Mondavi did not respond to our requests for comment. Brown welcomed the advisory. “Anything Cal/OSHA can do to remind and inform employers of their legal responsibilities to protect their employees’ health and to provide information on how they protect their health would be a big advantage,” he said.